The Devenick gas field is situated in Blocks 9/29a and 9/24b of the UK Continental Shelf (UKCS) in the central North Sea, in water depths of 116m. The field, is a high pressure, high temperature (HP-HT) gas condensate discovery which is estimated to contain about 430 billion standard cubic feet (bcf) of gas. The field is initially being exploited through two gas production wells (S1 and S2). 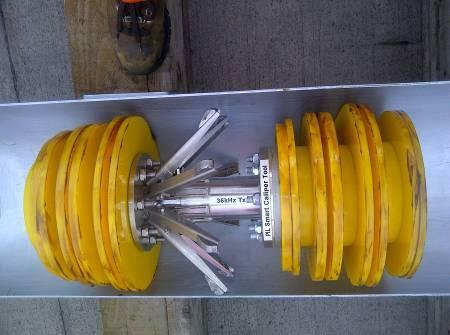 which are tied-back to a four-slot subsea manifold. The gas is then transported through a specially insulated 10” diameter pipeline to the East Brae platform. The pipeline is constructed as a pipe-in-pipe (PIP) with a 10” inner pipe and a 16” outer pipe with insulation material in the annulus. In July 2010, Technip was awarded a contract to provide project management, design, construction, installation and commissioning of the production pipeline. The field was successfully brought into production in the first week of October 2012. The development required an investment of around £650m (in excess of $1bn). a fully rated 10” section 217m long with a wall thickness of 27mm and a nominal ID of 219.1mm. As part of the pre-commissioning procedures, Technip were required to gauge the pipeline to confirm the pipeline integrity before carrying out the Hydrotest and other commissioning operations. 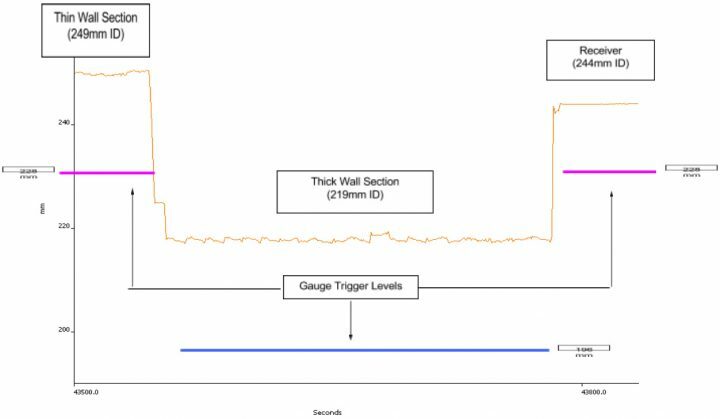 An additional requirement from Technip was the preference for using a Smart Gauge pig, which was capable of detecting a hit on the gauge plate and triggering an acoustic pinger response that could be picked up when the gauge pig entered the receiver. Remote detection of the gauge plate condition would allow Technip to make a decision on whether the gauging pig could be left in the receiver for recovery at a later date, when support vessels were available or, if a hit had occurred, recovering the pig and downloading data to discover where the hit had occurred. Because of the dual diameter nature of the pipeline, a gauge pig with a solid gauge plate could only be used to gauge the smallest pipe ID. Smart Gauge pigs are available with the gauge plate electronically wired to trigger an acoustic pinger in the event of a gauge plate hit. However, these devices use a hard gauge plate and are only able to be configured for a single pipe ID. Engineers from Pipeline Innovations Ltd (PIL) had previously developed a Smart Gauge Pig with a flexible gauge plate linked to an acoustic pinger for remote indication. Whilst this device was capable of operating in a dual diameter line, the hit detection electronics would only be operational in one of the diameters. No solution was therefore available to gauge both pipe IDs and to give a remote indication of gauge plate condition for both. Because of their previous experience in developing Smart Gauge Pig technology, PIL was approached by Technip to explore possible solutions to the problem. The solution proposed by PIL was the Smart Caliper Tool. The Smart Caliper Tool, developed by PIL specifically for this job, is based on a multi-channel caliper pig with real time on-board processing of the data to compare the measured pipe diameters with the respective gauging diameters in each section of the pipeline. The pig included an integrated acoustic pinger, which transmitted different ping rates depending on whether the on-board software had detected a breach of either, both, or none of the gauge diameters. 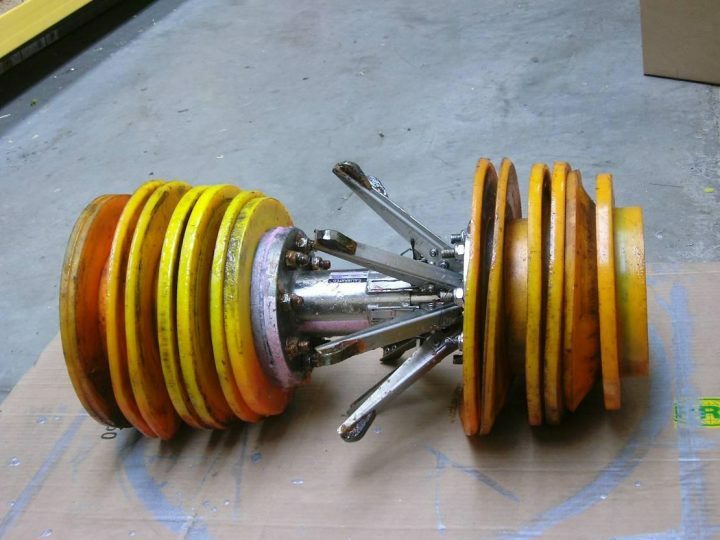 An acoustic receiver positioned on the subsea PLR, at the end of the run, detected the gauge condition so that if no ‘hits’ had occurred, the pig could be left in the receiver for later recovery when support vessels were available. On a standard multi-channel caliper tool, signals from sensors attached to caliper arms running along the pipe wall are recorded on a data logging system as the pig runs through the pipeline. 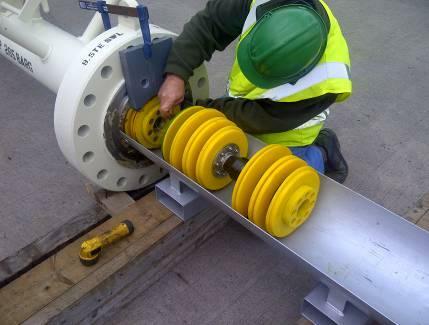 On completion of the run, data is downloaded from the caliper tool onto a laptop, where the caliper signals are calibrated and processed to display pipe radius and diameter values. On the Smart caliper tool, the caliper sensor signals are calibrated and processed in real time as they are collected. For each scan, the on-board microprocessor uses the signals from the 8 individual caliper sensors to calculate the mean internal pipe diameter on a rolling average basis and also the instantaneous internal diameter values across the four opposite sensor pairs. The microprocessor first of all uses the mean diameter measurement to determine which section of pipe it is passing through. It then selects the appropriate gauging diameter for this section and compares each of the 4 internal diameters against the gauge diameter. If any of the measured IDs are lower than the pre-set gauge threshold then the processor triggers a change in the acoustic pinger transmit sequence. The acoustic pinger was configured to emit a ping approximately every 2 seconds. This is called the ping rate which is constant under all conditions, ensuring that the pinger can be used to locate the pig in the event of it becoming stuck in the line. Pig to be retained in receiver during hydrotest and required to survive hydrotest pressure of 395 bar. The pig was designed as a multi-channel caliper tool with an integrated acoustic pinger on a single pig body. The PU disc stack was configured as a bi-di arrangement with guide and seal discs suitable for running in pipe IDs of 248mm and 219mm. The pig had eight caliper arms with hardened tips for running along the inside wall of the pipe. In order to simplify the mechanical aspects of the pig it was decided not to include an odometer wheel system for measuring distance. The combined acoustic pinger and caliper system had a run time capability of 100 hours. In order to comply with the requirement for up to 1 month delay between loading and startup, the pig was fitted with the PIL magnetic pull pin auto-start mechanism. The pin can be tied off to either the preceding or the following pig in a multi-pig launcher so that when the pigs are launched, the pin is pulled and the pig is powered up. Because the technology was untried under operational conditions, the client requested that two Smart Calipers be produced and run in the line, in case of possible failures. The Calipers were set up with different pinger frequencies to prevent interference between the two pigs and allow both pigs to be interrogated at the end of the run. The three pigs were positioned on the loading tray in running order. The start pin for SC01 was tied off to the rear of the flooding pig and the start pin for SC02 was tied off to the rear of SC01. The three pigs were then pushed into the launch header, ensuring that the start pin tie-offs were not interfered with. On 27th September 2011, the launch header containing the three pigs was mobilised to Evanton. On 2nd October 2011, the launcher was connected to the end of the 33.2km pipeline on board the Technip Apache II Pipelay vessel. On 2nd October, the pipeline end and launcher were deployed to the sea bed. Flooding operations began on 30th October 2011. The flooding pig was launched first followed 14 minutes later by the caliper pig SC01. On entering the pig receiver, the acoustic transmissions from the pigs were monitored by an acoustic transducer positioned external to the receiver. It is reported that on entering the receiver, the emissions from the pig SC01 were following the sequence 30 seconds ON and 30 seconds OFF indicating no hits in either section of the pipeline (see section 2). The acoustic emissions from pig SC02 were reported as continuous pings with no ON or OFF periods. This sequence is not one of the allowed sequences (see section 2). It is concluded therefore that pig SC02 was faulty. Based on the response from pig SC01 which appeared to be working correctly, the decision was taken that no gauge ‘hits’ had occurred in either the main pipeline or the fully rated section and therefore the pigs could be left for recovery at a later date. On completion of the flooding operation, the pipeline was subjected to hydrotest at a pressure of 395bar. The hydrotest operations were in progress from 9th November to 14th November 2011. The pig receiver was disconnected from the line and recovered to the surface on 25th March 2012, by the Dive Support Vessel Orelia. The two pigs were returned to the Pipeline Innovations factory for data download and assessment of pig condition. The caliper tools were examined on return to the PIL workshop. Both tools appeared to be in good condition with no damage to the caliper arms or the PU discs. The rear disc stack from both pigs was removed to gain access to the download connector. It was observed that the acoustic pinger transducer on pig SC02 had a large crack in the transducer housing. On further investigation, water was found to have entered the main pressure vessel through the cracked transducer housing and the data pack was a write-off. Communication with pig SC01 was successfully achieved and a full set of data downloaded. Examination of the data confirmed that the Smart pig was powered up when the preceding cleaning pig was launched and that the smart pig was launched 14 minutes later. The smart pig was recording data when it left the launcher and continued to record data along the full length of the main pipeline, through the fully rated section and into the receiver. Data quality was excellent with pipe bores and diameters measured to within +/- 1mm. The Smart Caliper tools were loaded into the PLR on 22 August 2011, more than 2 months prior to the gauging run. On completion of the gauging run, the tools were subjected to a hydrotest pressure of 395bar and then left in the line for a further 4 months before recovery to the surface. The gauging operations were completed successfully with the dual diameter gauging result being transmitted to a detector on the outside of the pig receiver. One of the pigs was found to be transmitting a non-standard code which was subsequently found to be due to ingress of water through a cracked acoustic transducer housing. The other pig was transmitting a No-Hit code and as this was taken as being the definitive result. When the pigs were eventually recovered, a full set of high quality caliper data was retrieved from the working pig allowing confirmation of the gauging result to be made and providing a good baseline caliper survey which will be available to the pipeline operator for future use.